I love using task cards to teach. They're great for introducing concepts, especially for vocabulary content and grammar practice. 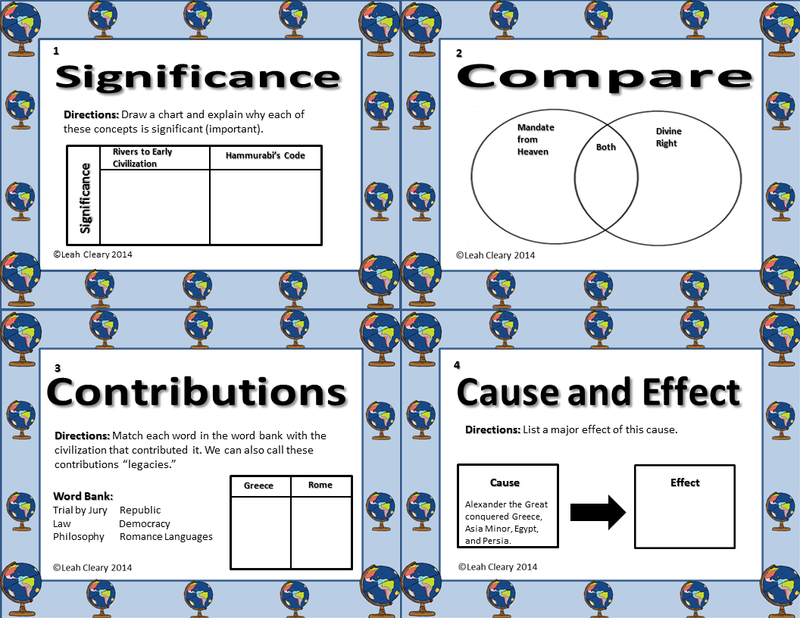 Get Vocabulary Task Cards Here! 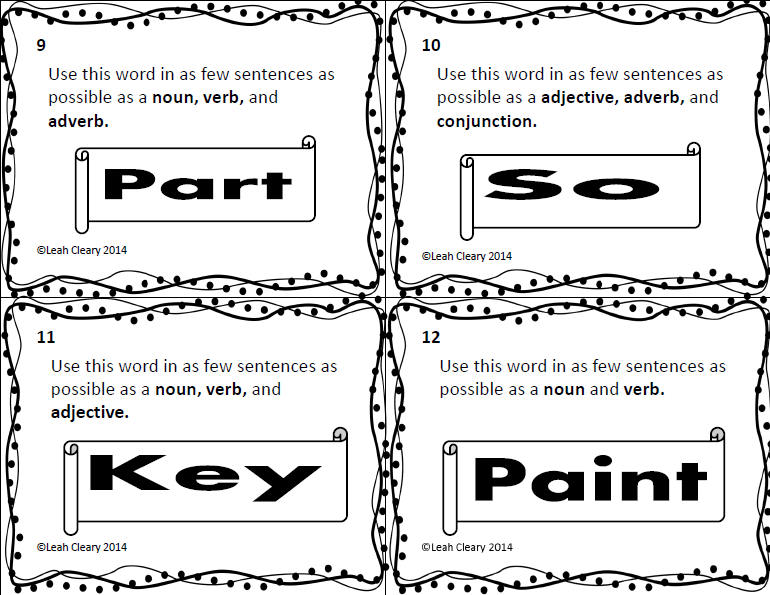 Get Parts of Speech Task Cards Here! Get Verbals Task Cards Here! But my new favorite way to use task cards is for test review. 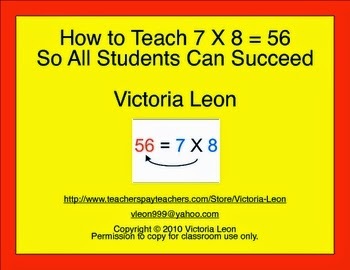 Since one task is printed on each small card, they do not overwhelm students. 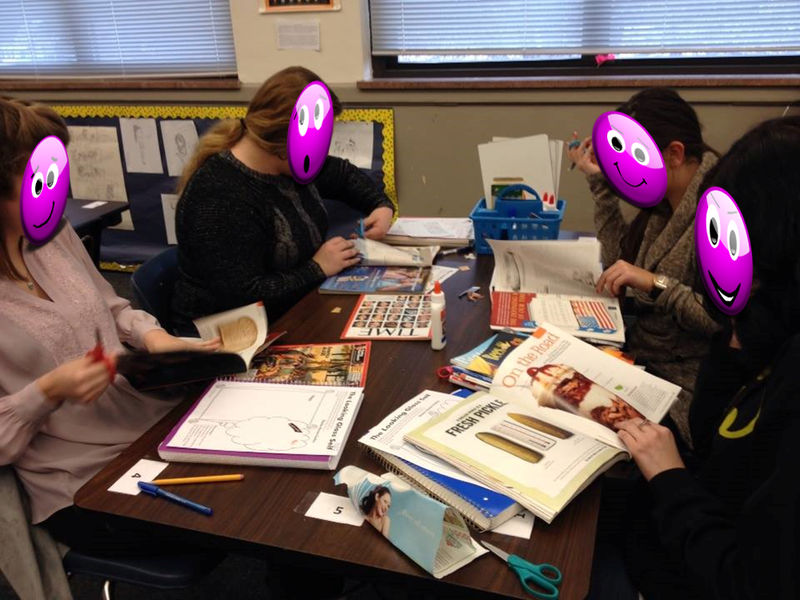 Students can work alone or in pairs, go back through their interactive notebooks, and revisit concepts. Last semester, I used them for our final exam review in my world history classes. A high school world history course spans from Ancient civilizations to the present day, so a final exam encompasses a lot of material. I broke the task cards into two sets--Ancient Civilizations through The Age of Exploration, and The Enlightenment and Revolutions through The Cold War, Post-Colonialism, and Terrorism. I put students into pairs, and gave them a few task cards to work on each day throughout the week. 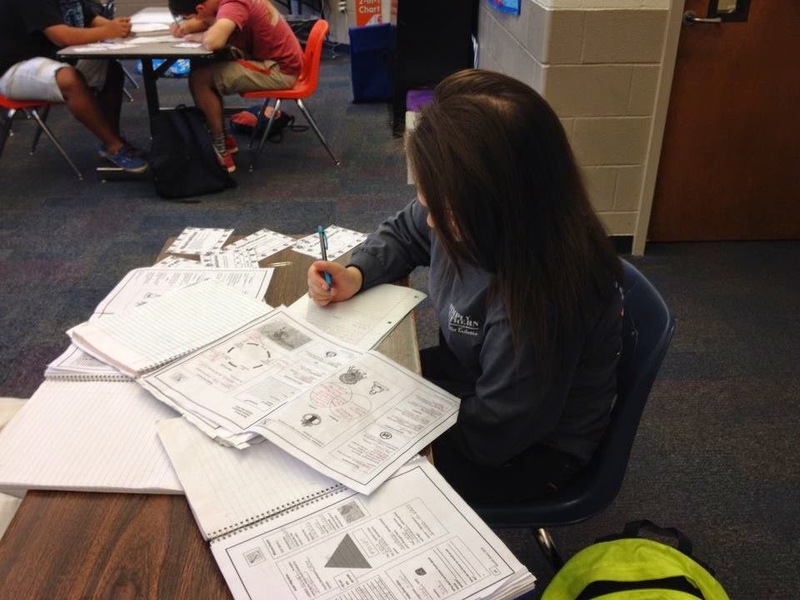 Students flip back through their interactive notebooks to work on each card. That's the great thing about Interactive Notebooks--they serve as giant study guides. Everything the students need is right there. -Put the students in groups of 4. -Have them tear a piece of paper into scraps, and place their group number on each scrap. -Project one question at a time. -Set a timer for between 30 and 60 seconds. -In that amount of time, students must agree on an answer in their groups, write it on a scrap piece of paper with their number on it, and send a group member to hand it to me. -If they get it to me with the correct answer before time is up, their group gets a point. -When the board is complete, the group with the most points wins (extra credit, a treat, etc…). 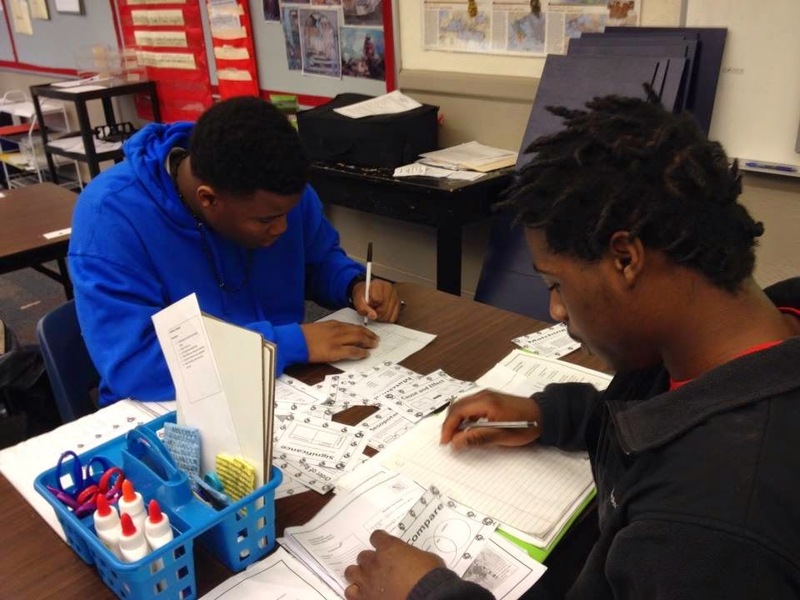 How do you use task cards in your classroom? Leave a comment below to let me know. Tonight, I was reading a blog post featured in The Washington Post by Ellie Herman. The title, Why So Many Teachers Feel Bad so Much of the Time, caught my eye. I clicked on it from twitter because I was curious. As a teacher who loves my job but often feels bad, I was intrigued. Was it about all the germs lurking in public schools? Old, moldy buildings? Sleepless nights planning lessons and grading essays? No, it was about something much more abstract, but just as pervasive--self doubt. That fog that hangs over your mind at 2 AM as you can't sleep because you feel like there must be something you forgot...that twinge that lurches through your stomach at 1 PM as an administrator ticks through a checklist at the back of your rowdy, over-crowded classroom...that jolt that electrifies your pulse at 10 AM as you listen to yet another pundit lay out yet another way to hold teachers accountable. The expectations on us are high, and we are under the microscope. We are entrusted with our students' learning, but we are not entrusted with creating the policy that impacts that learning. Instead, we are viewed as incompetent at best, political fodder at worst. It's no wonder that doubt pervades a teacher's professional life. Teachers are never just teachers. We are actors, counselors, secretaries, social workers, managers, sales people....The list goes on. How can anyone be an expert in each area? The truth is, we can't. We all have our strengths and weaknesses, which is why teachers' collaborating with other teachers to create policy for the area in which we have been trained--many of us with several degrees and years of experience--is the only answer for actual improvements in education. This will restore the public faith in teaching as a profession--and our faith in ourselves as professionals. Sorry to wax political, but as we are undergoing the third major overhaul of teacher evaluations in my 12 year career, and I'm feeling "bad" about it, it seemed relevant. Of course, as any teacher who's been at it long enough understands, at the end of the day, we can go into our classrooms, shut out the noise, and teach. And underneath the cacophony, that is our primary business. 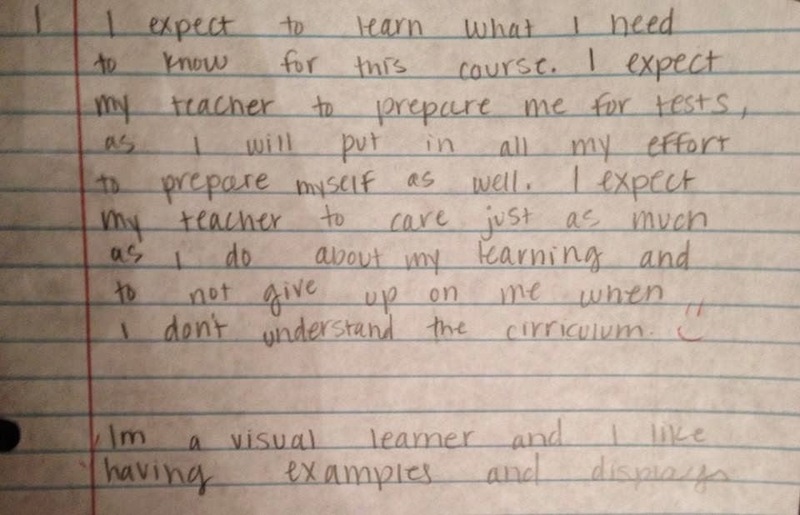 What makes you feel "bad" about teaching? What is the solution? Leave a comment below to let me know. Since I teach on the block schedule, I start over every semester. If you read my "Ringing in the (Teacher) New Year" post, then you know that my goal is always to learn my students' names by the end of the first day. It's great for classroom management but also a lot of fun to see the looks on their faces when I greet them by name in the halls ;). A bit disconcerting for them. But my favorite class by far in the first week of the term is Sociology. Mostly seniors take it at my school, and it's an elective, so it's prime real estate for a lot of fun. 1. We imagine how we must appear to others. 2. We imagine the judgment of that appearance. 3. We develop our self through the judgments of others. One thing that is so valuable about this activity is the foldable. Students write a paragraph about how they think others see them, and a partner writes a paragraph about how they actually see them (with strict parameters, of course). What I absolutely LOVE is when a student says something to the effect of, "I feel like I come across as a very weak person." And the partner says, "She comes across as very strong and confident. "Or, "I think people see me as unintelligent," and the partner says, "He seems very smart." Get the Entire Lesson Here! 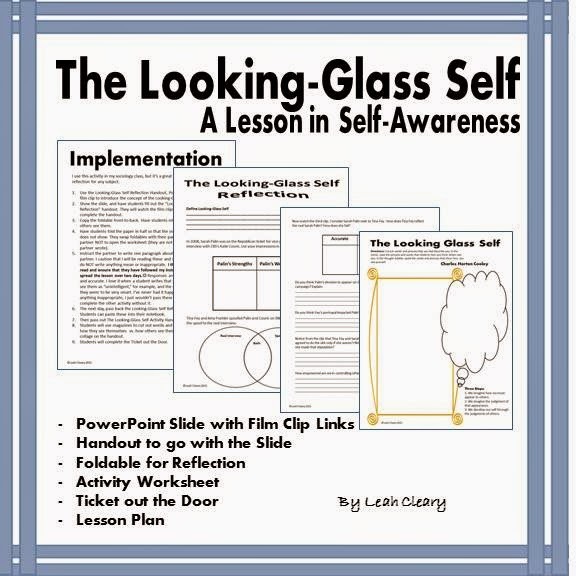 My Fabulous Freebie Find this week is similarly reflective with an element of fun. 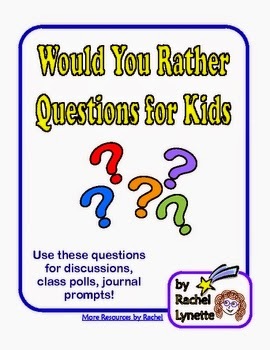 Rachel Lynette has created a "Would You Rather for Kids" activity that encourages students to consider which option they would choose in various situations. It's perfect if you have a few minutes to spare at the end of the block. I tried a few of the questions with Poll Everywhere, and my students loved it! Grab it for free HERE! How do you encourage your students to be more reflective? Leave a comment below to let me know. Today was my first day back with the students. The unique situation in my county is that we are on the block schedule. That means I have all new students...new faces and names to remember, new parents to get to know. I have mixed feelings about the block schedule. On the one hand, we get a fresh start each semester. On the other, we get a fresh start each semester. Much has been written about the block schedule, and many systems have tried and subsequently abandoned it. Here's a short pros and cons article about both the block and traditional scheduling. And the block schedule has many pitfalls. Think about it--if you're on a 4/4 schedule (4 courses one semester, and a different 4 the next), like we are, then students could feasibly go an entire year without an English or a math class--not a good thing for even the brightest of students. Imagine the implications for struggling ones. But it also enables our county to offer students an amazing opportunity--the option for dual enrollment at the local charter school. Students who take advantage of this can graduate from high school with certification to be a medical or dental assistant, or a welder. They can take courses in graphic art, video game design, or work-based learning--they can even take a course for future educators, complete with an internship. Logistically, this particular charter model would not work without the block schedule. Students have to commute between the charter and their base high school daily. Even as a teacher of academic subjects, I see the benefits of offering students real-world opportunities while they are still in high school. Imagine being able to work your way through college as a dental assistant (a far cry from the waitress I was), or upon high school graduation, being equipped to begin your career as a mechanic? Here's an article about the success of the program. The block schedule is not perfect, but I can't think of a better way for my county to offer the charter school opportunity to our students. Can you? Leave a comment below, and let me know! And don't forget to come back next week when I discuss vocabulary and interactive notebooks in sociology!